The Enlightenment Era, also known as the Age of Reason, took place in Europe and North America prominently in the 17th and 18th centuries. This time period is most known for advancements in philosophy, art, and culture among educated intellectuals. The era is characterized by using reason and logic to question longstanding truths surrounding Christianity and science, as well as prevailing government practices, and freedoms surrounding the human condition (Power, 2002). It is often overgeneralized that the “salon-like” philosophe social gatherings were similar in structure, however, during this period across Europe, patterns of socialization were unalike and individual in their own respects. Each gathering was unique to its region and largely influenced by cultural tradition with respect to chocolate. Out of all of the different social gatherings observed in the Western World during the Enlightenment Era, chocolate being served as a drink was most prevalent in the Spanish Tertulia social gatherings. Such gatherings played an essential role in shaping European Enlightenment culture, although this influence is often overlooked and underplayed. Tertulias were social gatherings of the wider Spanish social classes where chocolate was served during the latter end of the 18th century Enlightenment Era (Samper 2001). These gatherings happened periodically, like a modern-day book club would convene, to discuss and debate current political issues, philosophical dilemmas, the arts, or even upcoming social gatherings such as bullfighting. These social gatherings took place in private, and semiprivate areas, and were an important catalyst for political, and cultural change in the Enlightenment era. Tertulias, in particular, were known for sharing and circulating various literary works and art. They shaped patterns of socialization, facilitated the exchange of ideas, and helped the spread of information amongst Spaniards with chocolate playing a pivotal role at such events. Chocolate was first adopted by the upper classes of Spain as a type of entertainment drink. It became so popular especially among the noblewomen who hosted each other for social gatherings. This was in part because Spanish noblewomen were marrying French royalty, and the Jesuits were bringing over the custom of drinking chocolate (Llopis, 1998). Chocolate was a regular offering at such tertulias along with various sweets, pastries, ice cream, and shaved ice. Traditionally in Spain, chocolate refreshments were served hot and made with a water base; however, as the Enlightenment era progressed Spaniards started crafting the drink the French way by using milk. Chocolate was a central component to the offerings delivered and was deemed the star of the gathering as it was the trendiest drink to be served. These chocolate drinks were a signal of elegance, sophistication, and extravagance.. These chocolate refreshments were plentiful and free-flowing within the tertulia. Chocolate took on a prestigious, and rich connotation because the chocolate drinks at this time had become an important staple amongst the Catalan nobility. Chocolate was the favorited drink among the Spanish enlightenment socialites from the 16th century until the 18th century, when coffee became popular in a similar fashion to how chocolate had been served at social gatherings. Overall, chocolate was the prevailing favorited non-alcoholic drink of the Spaniards at these tertulias. When one thinks of the Age of Reason, often the first thing that comes to mind is the French salons. Surprisingly, among the French philosophes, coffee was a more popular drink than chocolate (Coe, 2013). In Tastes of Paradise, Schivelbusch describes chocolate in Europe as being Catholic, aristocratic, and particularly southern, while coffee is described as northern, protestant, and middle class. It was truly at Tertulias in the south of Spain where chocolate drinking was so vital to the Spanish upper class. While chocolate was still being served in different forms in countries such as England, Italy, and America as part of food, medicine, and even poison at the time, chocolate took on a level of popularity in drink form in Southern Spain that was unseen anywhere else during the time. Chocolate drinks were essential to the Tertulias and played a central role in gathering Spaniards to discuss relevant Enlightenment issues. Coe, Sophie D., and Michael D. Coe. The True History of Chocolate. London: Thames and Hudson, 2013. “En Ce Moment Important Old Master Paintings and Sculpture.” Lemonnier, Anicet-charles-gabrie ||| History ||| Sotheby’s N08952lot4csp3fr. Accessed March 22, 2019. http://www.sothebys.com/fr/auctions/ecatalogue/2013/old-master-paintings-n08952/lot.93.html. Gay, Claudio, 1800-1873. Una tertulia en Santiago, 1840 . Disponible en Memoria Chilena, Biblioteca Nacional de Chile http://www.memoriachilena.gob.cl/602/w3-article-99696.html. Accedido en 3/21/2019. Llopis, Manuel Martínez. Historia De La Gastronomía Española. Barcelona: Altaya, 1998. Madrazo Y Garreta, Raimundo. Hot Chocolate. 1884. Power, Marcus. “Enlightenment and the era of modernity.” The companion to development studies (2002): 65. This increase in consumption over such a relatively short time period produces a number of questions. The idea that sugar could go from not being known to a main provider of calories in the English diet in a few hundred years is astonishing. This post looks to explore the various factors that lead to this growth and will analyze the English diet prior to sugar’s introduction as well as the rise of chocolate in England that contributed to the increase in sugar consumption. To understand the rise of chocolate in England one must first understand the diet the English population was consuming before introduced to sugar. It was at this time that “most people in England and elsewhere were struggling to stabilize their diets around adequate quantities of starch (in the form of wheat or grains)”(Mintz 13). Today this type of diet is known as “one starch ‘centricity’”(Mintz 14) and still today is what leads to a number of world hunger problems. With this in mind one is able to see how the introduction of sugar to the English population could have an effect not just because of the taste but the nutritional element as well. This is not to say that the taste, the sweetness of the sugar did not play a large part in the increase of consumption as well since sugar both “satisfies the human appetite for sweetness and contributes calories to our diet”(Galloway 437). Having the ability to satisfy our cravings for sweetness is a big deal seeing that many researchers believe that “there is a built in human likeness for sweet taste”(Mintz 14). In addition to this research “many scholars have promoted the thesis that mammalian responsiveness to sweetness arose because for millions of years a sweet taste served to indicate edibility to the tasting organism”(Mintz 15). Therefore, the rise of sugar in England during this time does not appear to be a random occurrence. One is able to see that sugar was a very dynamic resource to the English population at this time. However the caloric value and sweet taste many not be solely responsible for sugars growth. In addition to the qualities mentioned above, sugar consumption grew so rapidly as a result of new types of foods and drinks that were mixed well with it. Making its way around Europe was this new beverage that was gaining in popularity. This beverage was called the ‘chocolate drink’. “In France, chocolate was strictly for the aristocracy, while in England it was available to all those who had the money to pay for it, and it was on offer to all who patronized coffee-shops. Chocolate was becoming democratized”(Coe 166). The greater access that the English had to chocolate the greater their consumption compared to those in other countries. English consumption of chocolate would increase further when Johannes van Houten invented the cocoa press in 1828. With this invention “the age-old, thick and foamy drink was dethroned by easily prepared, more easily digestible cocoa. Van Houten’s invention…made possible the large-scale manufacture of cheap chocolate for the masses, in both powdered and solid form”(Coe 235). This lead to a product more similar to what we know today a chocolate. It is in this form that cocoa was mixed with sugar along with other ingredients to make milk chocolate. It was also at this time that those in England began to mix sugar with other beverages, like coffee, and foods to add a sweeter taste. The combination of all these factors leads to the growth of sugar consumption in England. Sugar became popular in England at a time when so much change was occurring throughout the nation. As more and more people in England were exposed to the resource its popularity grew at an increasing rate. It was able to do this as a result of the caloric value it provided in addition to the natural sweetness it could provide to the human taste bud. With the help of the introduction of chocolate as well as other food and drinks, sugar was able to continue its expansion into other food groups until it became a staple of the English diet. Galloway, J. H. “Sugar.” The Cambridge World History of Food, edited by Kenneth F. Kiple and Kriemhild Coneè Ornelas, Cambridge University Press, Cambridge, 2000, pp. 437–449. Mintz, Sidney W. Sweetness and Power : the Place of Sugar in Modern History. Penguin Books, 1986. In today’s world, sugar is one of the most widely found consumables across the globe. From soda, to candy, baked goods, and everything in between, sugar’s presence in 21st century life is undeniable. But it hasn’t always been this way – less than a millennium ago, sugar was an item reserved for the very wealthiest of society. Viewing the historical change in sugar through the lens of the British Empire is an apt way through which to understand sugar’s rise to quotidien usage, both on the European continent, and across the world. Over time, sugar went from being utilized in British medicine and serving a luxury good for only the elites of the country, to firmly entrenching itself as a staple of mainstream British society. This change, which can in large part be attributed to the increased production of sugar across the British colonies, especially in the West Indies, represented a shift in the way sugar was perceived across the country and continent. Previously seen as an example of the chasm present between socioeconomic classes within the British Empire, sugar’s broad appeal and its versatile usages, from decorative material to spice, medecine, preservative, and finally sweetener, were predominantly responsible for its rise to prominence. Sugar has been grown since as early as 500 B.C., where it was harvested in the Ganges River Valley of modern-day India. However, it took over 1,500 years for the substance to appear with regularity in Europe – the first example of which was seen entering through the port of Venice (Rivard, 422-423). When sugar first appeared on the European continent, its function was markedly different from what it has become in the 21st century. The arrival of sugar to the continent in the early 12th century was characterized primarily by its usage as an expensive, exotic spice, reserved for usage by only the most wealthy members of society (Mintz, 79-80). In the centuries that followed, sugar’s impact in the British Empire remained relatively minute, with the exception of its role in health and wellness. Sugar was frequently used as a cure for ailments, building off of many Islamic and Byzantine doctors’ proclivity for using the substance for medicinal purposes. Sugar’s place in the medical community of Europe and Britain specifically became so significant from the 13th century onward, that the expression “like an apothecary without sugar” became a commonplace phrase to describe a state of desperation (Mintz, 101). While the utilization of sugar as a remedy was not without its controversy, the English’s adaptation of the substance as a potential remedy to cure illness helped bring sugar into a more prominent role within the British Empire. Although its widespread consumption from a gastronomical perspective would not occur for several centuries, sugar’s importance within the medical and elite communities of the Empire helped set the stage for its emergence into everyday English life. While its initial presence in the British Empire was restricted to only the most affluent elites of the period, the 1400s and 1500s saw a significant uptick in the harvesting of sugar, especially in the colonies of Great Britain (Rivard, 423). Although its status in the 1500s and 1600s remained that of an “object of a sustained vogue in Northern europe”, its consumption in England increased 5-fold in the ensuing century (Godoy). A series of political events, like the Dutch Revolt and the loss of the Spanish Armada to the British also played a part in this shift. Coupled with the rampant popularity of sugar amongst those it was available to, the resulting effect was a significant uptick in the shipments of sugar from Barbados and the other British colonies of the West Indies (Rivard, 423). These shipments allowed British consumer culture to As this rise in sugar consumption continued, the British government steadily reduced the tax on the product through the 18th and 19th centuries, until it was completely eliminated in 1874. As a result, the per capita consumption of sugar rose from four pounds per year in 1700, to a jaw-dropping 90 pounds per year by 1900 (Rivard, 423). This over 20-times increase was a reflection of both the populous’ love of the substance, and the quickly growing sugar industry’s willingness to meet the demands, often by ethically questionable means. In order to keep up with the widespread desire for sugar across Great Britain, the Empire turned to slavery to help bridge the gap between supply and demand. The slave trade, particularly in Jamaica, became an extremely lucrative endeavor, and a viable manner by which the British Empire could fulfill the desire for sugar amongst the British citizenry. A 1770s survey conducted by Richard Brinsley Sheridan, a member of the British parliament, revealed that 59 percent of Jamaica’s slave population was tasked with growing sugar, desperately trying to keep up with British demand (Thomas, 33). The number of resources that were dedicated to producing sugar in the islands of the Caribbean and West Indies was truly staggering. By the year 1773, Jamaica alone featured at least 775 sugar plantations across the 150 mile-long island, rendering the colony one of the most valuable components of the entire British Empire (Thomas, 33). This large-scale commitment to the manufacturing of sugar allowed the substance to become more and more prevalent in Great Britain, from drinks, to chocolate, and everything in between. This rise resulted in books like “Mrs. Hannah Glasse’s special confectionery cookbook”, produced in 1760 and outlining the variety of recipes incorporating sugar, finally available to the middle class of Britain (Mintz, 117). Even the poor citizenry of Great Britain had reason to supplement their diets with sugar. The preparation of “hasty pudding”, a type of oatmeal porridge, as well as molasses and tea, were quotidian treats for the working-class of the empire to enjoy sugar as well (Mintz, 118). Compared to its initial appearance in the 1300s and 1400s, the prominence of sugar in Great Britain became practically incomparable by the late 1700s. Not only was there a revolution in the demand for the substance, but the British Empire, in response, markedly increased its production across the West Indies and Caribbean. Barbados and Jamaica were particularly responsible for the influx of sugar into Great Britain and Western Europe, often through slave labor or indentured servitude. These ethically questionable means were an inevitable step taken by the British Empire, who saw an opportunity to greatly increase the monetization of the “sugar colonies”, and meet the demand of the middle and working classes of Great Britain in the process. Initially a substance reserved exclusively for medicine, and only the most elite of British society, the ensuing centuries resulted in a country-wide, and continent-wide, obsession with sugar, that led to an increase of over 20-fold in the per capita consumption of Great Britain. The factors of consumer culture, political colonization, and evolving taste preferences, all played significant roles in this transformation. The case of sugar in Great Britain is an apt case through which to study these different conditions, and the effects they had across several centuries. Mintz, S. (1986). Sweetness and power : The place of sugar in modern history. New York: Penguin Books. Rivard, C., Thomas, J., Lanaspa, M., & Johnson, R. (2013). Sack and sugar, and the aetiology of gout in England between 1650 and 1900. Rheumatology,52(3), 421-426. Thomas, Robert Paul. “The Sugar Colonies of the Old Empire: Profit or Loss for Great Britain?” The Economic History Review, vol. 21, no. 1, 1968, pp. 30–45. In the second millennium, the introduction of sugar transformed the Western diet. Today, the extreme rate of consumption is both a major health concern and a staple of the modern diet. Only a handful of centuries ago, sugar was a rare commodity reserved only to be used sparingly by the wealthy. Within time, however, production increased and with that came an increase in the accessibility of sugar. In the 18th century alone, British sugar consumption nearly quintupled (Mintz 67). Throughout Europe, sugar consumption transformed from a delicacy to an essential ingredient used as a sweetener, a medicine, and a preservative among other things. Today, we continue to experience the outcome of this landmark growth. The figure shows a sharp and consistent increase in sugar consumption over time. Historians estimate that sugar was first introduced in Europe around the turn of the 12th century. At the time, traders grouped the product with ‘spices’ (Mintz 79). This trend was matched in the kitchen as when studying the ‘cookbooks’ of the era, one can see that sugar was considered only but a ‘spice’ or condiment as they used it only in very small quantities in their recipes. This was due in large part to the exorbitant price of the new commodity. The product was only accessibly priced to the rich and even they struggled to afford it. Soon, however, drawn by the natural human liking to sugar’s sweet flavor, people found ways to increase the production of sugar. By the 16th century, sugar had become more plentiful and more affordable. In turn, the product was no longer reserved to be used in small quantities by the wealthy (Mintz 86). Therefore, there were various new uses of sugar that emerged. First, artists used the the pure, white, and durable nature of sugar to make decorations (87). These artists would combine sugar with other foods to create sculptures such as animals or palaces (89). Due to sugar’s continued luxury status, these decorations gloriously boasted one’s class and wealth (95). People still use sugar as a decoration today when they make chocolate bunnies or wedding cakes. Second, many used the sweet stimulant, ironically, as a medicine. Today, experts agree that, coupled with a sedentary lifestyle, sugary products can cause obesity (Coe 31). When sugar was first introduced to Europe, however, scholars pointed to the the medicinal lore of sugar referenced in classical Islamic texts (Mintz 96). Many went so far as to argue that sugar was a type of panacea. Soon, the stimulant was a staple of apothecaries across Europe (101). Additionally, sugar was used as a preservative. Sucrose, the chemical compound found in sugar, has a capacity to draw out moisture. This prevents microorganisms from developing a breeding environment (Mintz 123). Thus, sugar can be used as a seal for edible materials against destructive bacteria. Recognizing this, people used sugar to protect an array of edible goods ranging from fruits to cheeses. This revolutionized the shelf life of nearly every food, thus impacting the common diet of Europeans. Human’s fundamentally and innately enjoy the sweet taste of sugar. Watch this baby’s first taste of sugar! The natural appeal made sugar a useful sweetener. Perhaps the most important usage of sugar, however, was as a sweetener. This effect was highlighted in juxtaposition to the introduction of exotic products such as coffee, tea, and chocolate (Mintz 108). In the 13th century, a Marco Polo led expedition connected the Western world to the Silk Road, a trade route that traversed Asia. Two centuries later, Christopher Columbus sailed the Santa Maria to the New World. These new discoveries introduced Europe to a myriad of new foods and flavors. These culinary discoveries famously include modern staples such as tea, coffee, and chocolate. All three of these products were introduced to Europe with luxurious undertones; the exotic nature of these products naturally made them delicacies that were associated with the wealthy and thus heavily sought after. Each has a bitter taste, however, that can be repulsive at first. People needed a second flavor to sell their taste buds on these products (109). Their solution was sugar: a flavor so sweet and naturally appealing to the human tongue that it can save any bitter flavor. This preference shined in arguably the most pivotal centuries of culinary history. With newfound globalization, new foods and beverages were being introduced and incorporated into daily life at a staggering pace (120). With these new food and beverages came new tastes and new urges to enjoy different tastes. At that moment, sugar shined as the great sweetener that it is. It no longer was the rare spice of the 12th century but an ingredient of foundational importance in everybody’s diet. Sugar consumption in Europe rose brilliantly in the 2nd millennium in Britain and the rest of Europe with wonders such as candy decorations and delicious chocolate. The joyful increase in consumption emerged hand-in-hand with a darker rise of production. With a big, untapped market for sugar, people needed to find ways to produce the crop more plentifully in the middle of the millennium. The dark solution to this problem was slavery. Europeans stole people from Africa to be used as slaves in the Caribbean to produce enough sugar to match the demand at home. The two ends of the Gulf Stream showed two very different realities of sugar. While Europeans enjoyed the sweet taste of sugar at home, African slaves were victims of the cruel business of sugar production in the Caribbean. Each sweet grain of the final product was sadly built on the shoulders of men who dare dream of nothing sweeter than freedom. The legacy of this tragedy today is a continued, heavy sugar trade imbalance where poor countries like India tend to produce most of the sugar and rich countries like the U.S. consume more than their share (USDA). The ubiquitous sugar universe we live in today is all thanks to centuries of injustice, and the health issues that arise from the modern rate of consumption are perhaps a late piece of karma that is pounding down the foothold of the sugar industry. Coe, Sophie D. and Coe, Michael D. The True History of Chocolate. Thames & Hudson, 1996. Mintz, Sidney. Sweetness and Power.. Penguin Books, 1985. United States Department of Agriculture. Sugar: World Markets and Trade. November 2018. Before the discovery of sugar, many Western societies had meals that were centered around common carbohydrates. Sidney Mintz, one of the founders of the Anthropology Department at Johns Hopkins University, stated, “The most striking [aspect of the] English diet at that time was its complete ordinariness and meagerness…. Most Europeans produced their own food locally” (74). The majority of families in Britain did not eat rare foods, or even meat, dairy, or fruit. The most common foods in British households stemmed from grains and starches. Members of the nobility and wealthy families were able to obtain and dine with more extravagant foods, since they could afford to purchase them from distant locations. Accordingly, when sugar was discovered and brought to European civilization in the mid-1600s, only this wealthy class of people had access to it. There was a sense of power and high social status that coincided with the ability to consume such a product. After over a hundred years, there was a large shift in the British appetite for sugar. 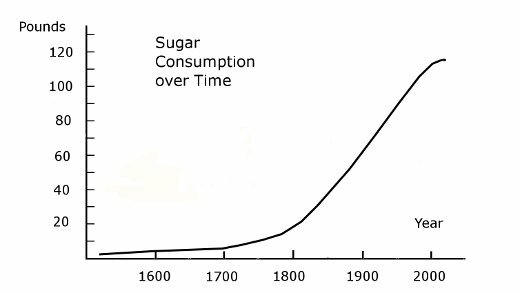 British consumption of sugar accelerated at almost an exponential level from the mid-1800s to the end of the 20th century, which was caused by newly discovered uses of sugar, increased access to sugar by the working and lower classes, and the plantation system that was implemented in the Caribbean, allowing for the mass production of sugar. Sugar consumption increased at almost an exponential rate after the mid-1800s in England. The two major dips in sugar consumption were due to World War I and World War II. When sugar reached the families of Western society, several uses were discovered that made sugar a vertaile product. Mintz stated, “In 1000 AD, few Europeans knew of the existence of sucrose, or cane sugar. But soon after they learned about it; by 1650, in England the nobility and the wealthy had become inveterate sugar eaters, and sugar figured in their medicine, literary imagery, and displays of rank” (5). Members of the nobility deemed sugar to be much more than a food with a new, distinct taste. Sugar had medicinal value and was used for a variety of ailments. This medical association was derived from Greek medical practices that were embraced by many British physicians. Discussing the history of sugar, The Guardian published, “[Sugar’s] consumption rose rapidly among European populations from the 17th century. Like tea, coffee, tobacco, chocolate and rum, it had physiological, consoling effects, particularly in children.” The consumers of sugar had many positive associations with the product and believed that it played a pivotal role in the healing process. This association of sugar and healing continued for centuries. In addition to the medicinal value placed on sugar, there were several other important uses that the British realized. Mintz stated, “Sucrose can be described initially in terms of five principal uses or ‘functions’: as medicine, spice-condiment, decorative material, sweetener, and preservative” (78). Even though in today’s era sugar as a sweetener seems to be a given, in the 1800s, sugar was even more useful as a spice. Sugar was presented to Europeans along with the other spices that were seen as rare at that time. The modern association of sugar being a main determinant of taste was a construct developed many years after sugar had been ingrained in European cultural and dietary habits. The various uses of sugar that the British explored made it extremely popular. Vincent Mahler stated, “With the turn of the nineteenth century the sugar boom seemed likely to continue indefinitely: colonial sugar was England’s single most important import in every year from 1703 until 1814” (473). The British were infatuated with the idea of sugar, and they began to associate it with all realms of life: religion, nutrition, politics, gender, and sexuality. The British elite and wealthy were the first individuals in England to be introduced to sugar. They believed that the consumption of sugar was a representation of their high social status. Sugar was served with several foods and beverages, including tea. The largest growth in sugar consumption occurred when the working and lower classes gained access it. Access to sugar was expanded due to the mass production of sugar, which made each serving cheaper, the production of lower quality, less refined sugar, and the increase in wages of the working class. David Richardson stated, “Contemporary writers referred also to the wider use of meat, tea, and sugar in northern working-class diets. Such dietary changes were made possible by relative improvements in real wages after 1750 in industrializing counties” (752). These areas focused on industrialization gave the working class the ability to pay for sugar and utilize many of the aspects of sugar enjoyed by the wealthy. One of those aspects of sugar that was used heavily by the working class once the use of sugar became more widespread was its function as a preservative. Mintz stated, “Sweetened preserves, which could be left standing indefinitely without spoiling and without refrigeration, which were cheap and appealing to children, and which tasted better than more costly butter with store-purchased bread, outstripped or replaced porridge” (130). It saved time for wives in working and lower class families that had jobs outside of the home. This use of sugar as a preservative made the product even more appealing to families who already were drawn to the taste itself. Tea, which was also considered a luxury in Europe when it was first introduced, had trickled down to the realm of the working class and had been used in conjunction with sugar. Richardson stated, “Explanations for the growth of British sugar consumption and its divergence from continental levels have largely focused upon changes in taste and diet, particularly the growth of tea and coffee drinking in Britain” (748). This phenomenon led to the increased use of sugar as well. The growing domestic demand of sugar in Britain was met because of the foothold the British established in the slave trade and the plantation system in the Caribbean. Slaves worked in unbearable conditions and were essential to mass production. With the growing interest and consumption of sugar, production needed to be expanded in order to meet the demand. The British used the slave trade as an avenue to meet their economic goals, and they were viewed as being at the forefront of capitalizing off of the institution of slavery. Mintz stated, “England fought the most, conquered the most colonies, imported the most slaves, and went furthest and fastest in creating a plantation system. The most important product of that system was sugar” (38). The British recognized the opportunity to not only meet the increasing demand of the country, but also profit off of the use of free labor. They established plantations throughout the Caribbean, beginning in Barbados and expanding into Jamaica, transporting millions and millions of slaves to produce sugar in mass quantities. Richardson stated, “Published estimates have suggested that British traders may have carried between 2.5 and 3.7 million slaves from African between 1701 and 1807” (741). The production of the large amounts of sugar that was dependent upon slave labor allowed the British to meet the growing demand for sugar domestically, while also allowing them to export the product past the country’s borders. Mahler stated, “Britain’s possessions in the Caribbean had entered the nineteenth century as perhaps her most valuable foreign economic interest” (474). The British dominance in the Caribbean boosted England’s economy and expanded its reach as an economic and political world power. Sugar served as a very powerful and influential tool in Britain, especially after the beginning of the 19th century. Even though the wealthy families of England were the first to be introduced to sugar, it quickly garnered traction throughout the country and was popularized as a food that many individuals in Western society wanted access to. With its versatile functionality as a medicine, spice, sweetener, preservative, and decorative material and its associations with religion, politics, and wealth, sugar became one of England’s most popular commodities. As demand increased and the working and lower classes had access to the product, Britain established a strong foothold in the slave trade and the plantation system in order to meet their domestic demands and profit off of the increased international consumption of sugar. “Britain Is Built on Sugar: Our National Sweet Tooth Defines Us.” The Guardian, Guardian News and Media, 12 Oct. 2007. Clark, William. Slaves Cutting the Sugar Cane. Antigua, 1823. Johnson, Richard J, et al. “Potential Role of Sugar (Fructose) in the Epidemic of Hypertension, Obesity and the Metabolic Syndrome, Diabetes, Kidney Disease, and Cardiovascular Disease.” The American Journal of Clinical Nutrition, vol. 86, no. 4, 1 Oct. 2007, pp. 899–906. Mahler, Vincent A. “Britain, the European Community, and the Developing Commonwealth: Dependence, Interdependence, and the Political Economy of Sugar.” International Organization, vol. 35, no. 3, 1981, pp. 467–492. Richardson, David. “The Slave Trade, Sugar, and British Economic Growth, 1748-1776.” Journal of Interdisciplinary History, vol. 17, no. 4, 1987, pp. 739–769. Tenre, Henry. Five O’Clock Tea. Paris, 1906. Chocolate is everywhere. From grocery stores to gas stations, this sweet tasting, divine bar of goodness is inescapable in normal American life, especially if you’re in poverty. While Americans consume 12 pounds of chocolate each year, Americans categorized as “in or near poverty” consume more chocolate than individuals who are not in poverty (O’Neil et al. ), and given that nearly 32% of the U.S. population is at or near poverty (Aulls), it is important to study their eating habits. The chocolate consumption habits of the poor, both in terms of quality and quantity, has consequences for both their health and ethical chocolate production. A study of the chocolate selection at the Dollar Tree shows that the chocolate marketed towards low income individuals is of the cheaper, unhealthier variety, produced without concern for human rights or the environment. The prevalence of Big, cheap chocolate is indicative of both the obesity and diabetes epidemic facing low income Americans today and the severe human rights violations and ethical concerns surrounding chocolate production. To get a concrete sense of the chocolate selection low income Americans often have and its implications for health and ethical concerns, I took a trip to the Dollar tree in Somerville. While there, I looked at several factors such as price point, types of chocolates available, the number of chocolates that were advertised as ethically certified through Utz or Fair Trade, and finally, the nutritional value of these types of chocolates. In this observation, only bars of chocolate or an amalgamation of chocolate and other ingredients (such as peanut butter or wafers) were studied. A Dollar Tree was chosen as a case study to represent the shopping experience of a low income American because of its prevalence in food deserts and “because the American economy of late has pushed so many middle-class people into poverty, and poverty is what pushes people to line up at the cash registers of…Dollar stores” (Griffin-Nolan). Food deserts “are areas where people have limited access to a variety of healthy and affordable food” (Dutko) and usually contain “households with low incomes, inadequate access to transportation, and a limited number of food retailers providing fresh produce” (Dutko). Since these individuals cannot afford cars, they rely on places such as convenience stores and dollar stores such as the Dollar Tree. In fact, “three chains, Dollar General, Family Dollar, and Dollar Tree, made up two-thirds of new stores in food deserts” (Schneider) because large grocery stores don’t want to risk lower profit margins. While obviously not all lower income Americans live in food deserts, nearly “23.5 million people” (Dutko) do. In addition, dollar stores offer individuals food products and other items at a fraction of other stores’ prices, making them the natural choice if you’re on a budget. Given that these stores also accept some form of EBT, or foods stamps, a Dollar Tree store is a good sample of a typical low income American’s shopping experience. A visual map showing where food deserts are located in the United States. Food deserts are areas that do not have grocery stores in close vicinity that carry fresh produce. This is why the map highlights the populations that do not have access to fresh food via grocery stores with darker colors. Notice how food deserts are concentrated in the southern part of the United States. There are however 3 primary issues with selecting a Dollar Tree. First, with some exceptions, everything in the store is $1, which may imply that craft chocolates or chocolates that were created ethically may be absent from the store due to their traditionally higher prices. Second, Dollar Trees are usually small, meaning the chocolate selection might be limited. Thirdly, low income Americans don’t always shop at the Dollar Tree, and may instead opt to visit a Walmart which might have a much larger chocolate selection. However, given that the closest Walmart in the Boston Metro area is over an hour and a half away on public transit while Dollar Trees are typically no more than 15 minutes away on transit anywhere in the city, studying a Dollar Tree might accurately represent where a low income person living in Boston may shop. The findings at the Dollar Tree were not surprising. Of the 37 different types of chocolate bars present, all but one of them were produced by either Mars, Nestle, or Hershey’s. The lone chocolate bar not created by the companies mentioned was created by Russell Stover. None of the chocolate bars were craft chocolate bars or produced by small companies. In addition, none of the chocolates were Fair Trade or Utz certified, or certified as organic. The only chocolate bar that was close to having a label marking it as ethical was Crunch, which had the Nestle Cocoa Plan label. According to Nestle’s website, the Cocoa Plan “aims to improve the lives of cocoa farmers and the quality of their products” (“The Nestle Cocoa Plan”); however, upon closer inspection of their website, it is unclear how this plan improves the livelihood of farmers or reduces child labor. Furthermore, the only chocolates without fillings were a Hershey’s Chocolate bar, the Russell Stover solid chocolate bar, the Dove Milk Chocolate bar, and Kisses. Other chocolates had a combination of nuts, peanut butter, caramel, mint, or wafer filling. In addition, there was only one white chocolate option, which was the Hershey’s Cookies ‘n’ Creme Bar. There were no dark chocolate options available. A picture of a chocolate bar selection at a Dollar Tree in Somerville (not all chocolate selections are pictured). As you can see, all the chocolates (or candies) present were produced by large corporations. Notice how Hershey’s has 9 chocolate cases on the stand and M&M’s has 5, suggesting that these are the most popular chocolates sold at this particular Dollar Tree. The price point was the same across all chocolates, which was $1. The Dollar Tree also had a value pack which included 6 smaller “fun size” chocolate bars of the same type in a packet for $1. The weight of the fun sized packet of chocolates was 75g or $.013/gram, while a normal chocolate bar was 1.55 oz, or about 44g, costing twice as much at $.022/gram. Only the Hershey’s Milk Chocolate Bar, Crunch, Snickers, Kit Kat, Reeses, 100 Grand, and Butterfingers bars were sold in fun sized packets, making them the cheapest chocolate options. A picture of the two sizes of chocolates sold (minus the candies in boxes). Chocolate was either sold in bar form (1.55 oz) or in fun sized packets (6/0.45oz, or 2.7oz total). Since each were a dollar, the fun sized packet is more economical, which encourages shoppers to buy more chocolate. Notice on the fun sized packet the “Nestle Cocoa Plan” Label, which is actually absent on the normal sized bar, and how the “100% Real Chocolate” claim on the normal bar was not on the fun sized packets; however, both had “No artificial Flavors of Colors” on the wrappers. Choosing to place different labels (an ethical one vs. a health conscience one) says something about who buys what, or who the company is trying to target with these two sizes. In terms of actual nutrition, the worst chocolate bar for saturated fat was a Hershey’s Milk Chocolate Bar, with 8g of saturated fat and 13g of total fat, and the best bar for saturated fat was the York Peppermint Patty, with 1.5 grams of saturated fat and 2.5 grams of total fat. The worst bar in terms of sugar was a Three Musketeers, with 40g of sugar, and the best in terms of sugar content was the Hershey’s Cookies ‘n’ Creme bar, which contained 19g of sugar. For reference, a healthy adult should consume between 25 and 37 grams of sugar each day and around 16g of saturated fat per day. The chocolate selection at the Dollar Tree has three worrisome implications: Big Chocolate takes advantage of gross human rights violations present in the chocolate supply chain to sell at low prices; Big Chocolate pumps chocolate bars with cheap alternatives such as sugar and other ingredients to even further lower the price of their chocolate bars; finally, because of the two reasons mentioned, the cheapest chocolate on the market (the one that low income Americans will buy) is filled with inordinate amounts of sugar and fat, fueling the diabetes and obesity epidemic plaguing low income Americans today. In the next section, I will substantiate these claims and explain how they feed into one another and result in unhealthy Americans and abused workers and farmers. The cheapest chocolate available at the Dollar Tree was produced by Big Chocolate companies, Mars, Nestle, and The Hershey Company. These companies typically get their cacao beans from West African farms or plantations by interacting with complicated systems involving national, government, and local powers (Martin); however, human rights violations run rampant on these farms. More often than not, these farms are pressured to lower their cost of production by these large chocolate corporations, which results in child labor, abuse, slavery, and extremely unsafe working conditions. Slavery and child labor are the most salient problems, which exposes nearly “half million to 1.5 million child workers” (ACI Group) to dangerous work conditions, with “more than half reporting injury at work” (Martin). Some individuals, including children, “are trafficked and forced to labor without or with little pay on cocoa farms” (Martin), but these human rights violations are often overlooked in favor of cheaper cacao prices. While human right violations in the chocolate supply chain decrease the price Big Chocolate pays for their cacao, their inclusion of insane amounts of sugar, milk, and other ingredients further pushes down the price of their chocolate. Let’s take a look at a normal Hershey’s Milk Chocolate Bar. According to the Nutrition Label, the ingredients are Milk Chocolate (Sugar; Milk; Chocolate; cocoa butter; Lactose; Milk Fat; Soy lecithin; PGPR, Emulsifier, Vanillin, Artificial Flavors). According to the FDA, “ingredients are listed in order of predominance, with the ingredients used in the greatest amount first, followed in descending order by those in smaller amounts” (FDA). Sugar is the first listed ingredient, which is vastly cheaper than cacao as sugar is about $0.26/lb. Assuming that “chocolate” is made of cacao beans, this is the most expensive ingredient used, since the ICCO price was around $1.35/lb on May 3, 2018, which is over 5 times the cost of sugar. It is clear that chocolate manufacturers inject their products with incredible amounts of sugar because it is the cheapest ingredient. But it wasn’t just Hershey’s; of the 37 bars I observed, all of them had sugar listed as the very first ingredient on the nutrition label, meaning these bars are no more than a hint of chocolate and a heap of sugar. In addition, most bars weren’t pure chocolate, but instead contained peanuts, caramel, nougat, and other cheaper costing ingredients that further increase the sugar content and decrease the cost to make the bar. Nutrition bar for a Hershey’s Milk Chocolate bar. Note the high saturated fat and sugar content. In addition, the first ingredient listed on the ingredients list in the parenthesis is sugar, implying that sugar comprises most of the bar, not milk or even cacao. Knowing that nearly all the candy bars had more sugar content than the recommended daily allowance, it’s apparent why the US population, especially the lower income one, is so incredibly unhealthy. The average amount of sugar present in these bars was 29 grams, while it is recommended that children consume no more than 25 grams of sugar daily, and adults between 25 and 37. But why is consuming so much sugar, which low income people disproportionately do, such a problem? Sugar has been identified as the leading cause for the obesity and diabetes outbreak in modern American. Although some experts argue that fat, not sugar, is the main proponent of diabetes and obesity, seeing who has funded sugar research is alarming. Multiple corporations such as Coca-Cola, Hershey’s, and Nabisco have given millions to the Sugar Association, or ISRF, to exonerate sugar. The ISRF attempted to shift the blame of obesity and diabetes to fat intake and create multiple research panels to argue that any research that points sugar to negative health claims is inconclusive. They have funded researchers such as Edward Biernan, who claimed that diabetics “need not pay strict attention to their sugar intake,” and Ancel Keys who claimed “Cholesterol and dietary fat—especially saturated fat—were the likely causes of heart disease” (Taubes). The FDA even subcontracted a committee “led by biochemist George W. Irving Jr., who had previously served two years as chairman” (Taubes) of the ISRF to determine if sugar was harmful, which has caused uncertainty of sugar’s effect on health for decades. However, while the ISRF and Big Chocolate tried to hide the truth about sugar, the verdict is out. New research suggests that not only is sugar “addictive in much the same way as cigarettes and alcohol,” but the “overconsumption of them is driving worldwide epidemics of obesity and type 2 diabetes” (Taubes). No wonder “obesity rates in the United States have more than doubled, while the incidence of diabetes has more than tripled” (Taubes). Regarding diabetes, “long term consumption of sucrose can result in a functional change in the capacity to metabolize carbohydrates and thus lead to diabetes mellitus” (Taubes). Rates of diabetes and obesity are even more startling among low income individuals and children. “Those live in the most poverty-dense counties are those most prone to obesity. Counties with poverty rates of >35% have obesity rates 145% greater than wealthy counties” (Levine). In addition, “diabetes may be up to two times more prevalent in low income populations compared to wealthy populations” (Rabi, Doreen M et al.). This is believed to the case because “that individuals who live in impoverished regions have poor access to fresh food,” (Levine) and are instead bombarded with food items that are loaded in sugar. This is consistent with the unhealthy and sugary chocolate selection at the Dollar Tree. Two maps indicating Obesity (Top) and Diabetes (Bottom) occurrences in the United States, with darker shades of blue indicating a higher percent of obese/diabetic people. Notice how these two maps are similar in that areas with higher rates obesity are the same ones with higher rates of diabetes, suggesting that there is a correlation between the two. In addition, there seems to be higher percentages of both obesity and diabetes in the South, which coincidentally homes more food deserts. In fact, the food desert map above shows a correlation between food deserts and obesity/diabetes since the areas that have a higher percentages of obesity/diabetes also have more food deserts. In regards to children, the “number of overweight children in the US has tripled since 1980” (Albritton 344), and low income children “were more likely to be overweight than higher income children (7 percent vs. 4 percent)” (Lin). Companies, such as Hershey’s, specifically target children to develop a lifetime loyalty of their products, and it’s working. Research shows that sugar is addicting, almost as addicting as tobacco (Albritton 344), and when children and even adults consume these products, they will desire their products throughout their life and continue to consume them with disastrous results. “Overweight children often become overweight adults, and overweight in adulthood increases the risk of developing many diseases, including type 2 diabetes, high blood pressure, coronary heart disease, stroke, and…cancer” (Lin). By understanding how Big Chocolate reduces the price of its chocolate, we can see how cheap chocolate has crippled the low income population in the United States. But a question still remains: given all this information on how terrible sugar and cheap chocolate are for you and the world, why do low income individuals continue to consume it? Do low income customers just not care the people who make their chocolate, or even their own health? Or is it that don’t have a choice, or the proper education to understand how sugar will affect them? Packaging and propaganda have made it incredibly difficult for low-income individuals to choose the products that match their values. They are bombarded with misleading information on bars that contain supposedly 45% less fat when in fact it contains twice the amount of recommended daily sugar, they are told that bars bought through the “Nestle Cocoa Plan” will help farmers and eliminate child labor when in reality no one understands how these organizations impact the lives of farmers, and lastly, they are told by their doctors and schools to reduce their saturated fats intake when it is in fact sugar that is killing them. While it may be true that some low income consumers just don’t care about what they buy, the widespread misinformation and the products available renders them almost helpless in choosing products that are good for them and the world. It’s on us to give not only these individuals, but everyone the power to know what we put into our bodies and its effect on the world around us. Perhaps it’s time to take the power out of Big Chocolate and Sugar’s hands and place it into where it belongs—the consumer’s. ACI Group. “Is Your Favorite Chocolate the Product of Child Labor?” Edited by The Nation Blogs, The Nation’s Blogs, ACI Information Group, 22 Dec. 2014, scholar.aci.info/view/1464ec3e2ee6b730146/14a738db750000f00b2. Dutko, Paula., et al. Characteristics and Influential Factors of Food Deserts. U.S. Dept. of Agriculture, Economic Research Service, 2012. Griffin-Nolan, Ed. “DOLLAR STORES MAKE A BUCK ON POVERTY.” Syracuse New Times, 6 Aug. 2014, p. 43. Lin, Biing-Hwan, and United States. Department of Agriculture. Economic Research Service, issuing body. Nutrition and Health Characteristics of Low-Income Populations. Body Weight Status. United States Department of Agriculture, Economic Research Service, 2005. Martin, Carla. AAAS 119x: Chocolate, Culture, and the Politics of Food .Lecture 7: Modern Day Slavery. 2018. O’Neil, Carol E., Victor L. Fulgoni, and Theresa A. Nicklas. “Association of Candy Consumption with Body Weight Measures, Other Health Risk Factors for Cardiovascular Disease, and Diet Quality in US Children and Adolescents: NHANES 1999–2004.” Food & Nutrition Research 55 (2011): 10.3402/fnr.v55i0.5794. PMC. Web. 3 May 2018. Rabi, Doreen M et al. “Association of Socio-Economic Status with Diabetes Prevalence and Utilization of Diabetes Care Services.” BMC Health Services Research 6 (2006): 124. PMC. Web. 4 May 2018. Schneider, Mike. “Grocery Chains Leave Food Deserts Barren.” The Epoch Times, 7 Dec. 2015, pp. A4–A5. “The Nestle Cocoa Plan” Nestle, 01 May. 2018, http://www.nestlecocoaplan.com.